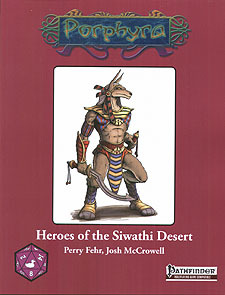 Study martial arts under a five spirits master (PRC), learn to bind genies (summoner), walk upon the guardian's path (psychic warrior), enter into the zendiqi traditions of mahdi or muhartik slayer, or become a pack lord of the savage gnolls in the desert. Select from over a dozen new feats including fighting style extension feats. The second book that begins to explore the Lands of Porphyra in depth.